I'm getting this error MSCVR100.dll missing , I downloaded a premium version and I still cannot fix the issue, do I have to delete some files prior downloading. How to download, install and use the DLL-Files.com Client. Once downloaded, start the clientsetup_demo.exe to install. 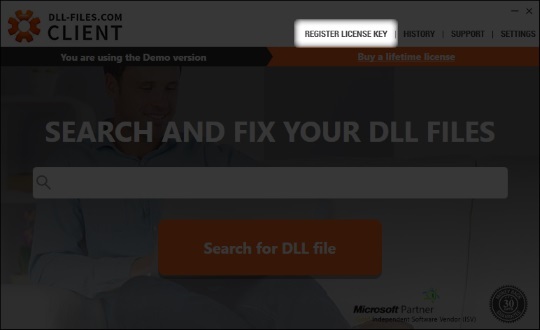 In order to register your copy of the DLL-files.com Client, go to “REGISTER LICENSE KEY”, insert your license key, and click “Register”. 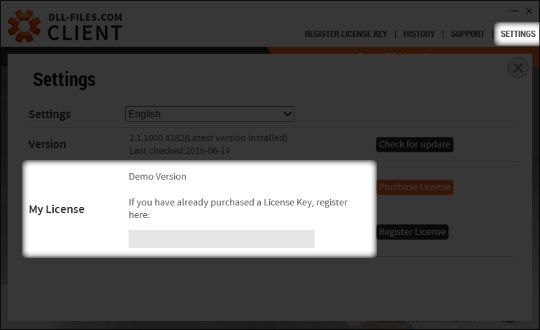 Or; go to “SETTINGS”, insert your license key at “My License”, and click “Register License”. All letters are upper case, all 0's the number zero. Do not remove any characters as the "-" dashes between segments. Make sure there are no spaces before or after the key in the input window. To be sure you enter the correct key, please try copy and pasting it, instead of typing by hand. To install a file, search for, and select the file you need. Click "Install" to install recommended version to default folder, or switch to "Advanced view" to select version and install location. What happens when you try to install the dll file using the DLL-Files.com Client? What is the error message you were hoping to solve by installing this file? What is the exact and complete error message you get? I had the same problem and don't replace this file, just remove the old not working version of the file and move new version to the folder where this file should be.